It’s been a long, cold, snowy winter here on the East coast. I’ve never liked Winter much. By the time January ends, I’m over it. February is my least favorite month of the whole year. As we enter March, I find myself desperate for sun, warmth, leaves on trees and bursts of color from blooming flowers. And that’s when it hit me. Pineapple curd. It uses lots of egg yolks. It’s bright yellow like a burst of sunshine and the pineapple flavor is like a tropical vacation for your tastebuds. 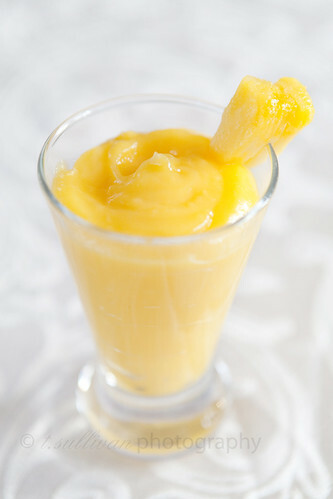 Pineapple curd is just what the doctor ordered at the end of a long winter. What can you do with pineapple curd? More like what can’t you do with it. Spread it on toast. Fill a cake with it. Stir it into some low-fat plain Greek yogurt for breakfast. Eat it with a spoon straight out of the container. (Don’t judge. You’ll do it too.) The possibilities are almost endless, which is good because I can’t stop eating it. The mixture may seem like it’s not thickening as you whisk over heat, but don’t stop – it thickens very quickly right at the end. For a smoother curd, push through a fine mesh strainer before storing. Press plastic wrap against the top of the curd to prevent a film from forming in the fridge. Combine all of the ingredients in a saucepan. Cook over medium heat for about 5-10 minutes, whisking constantly, until mixture thickens. Remove from heat and cool. Store in an airtight container in the refrigerator for up to two weeks. The color of this is so beautiful. I can’t wait to try it. Whenever I have extra egg whites, I make an egg white omelet, which seems pretty perfect as I can eat it with toast slathered with this curd! Oh wow, what a wonderful idea! The color is gorgeous, too. Yum!! I can’t wait to try this. I have been eating Lemon Curd for the past two weeks and it didn’t even occur to me that it could be made with other fruits. This looks fantastic!! You could use this curd as a base to ice cream! YUM! I love pineapple! The curd looks fantastic! I bet it’s delicious. Wow that looks amazing! So bright and beautiful, thanks for posting! I feel the same way about February. I have never tasted pineapple curd, but it looks yummy. And the color makes me happy. This is brilliant! 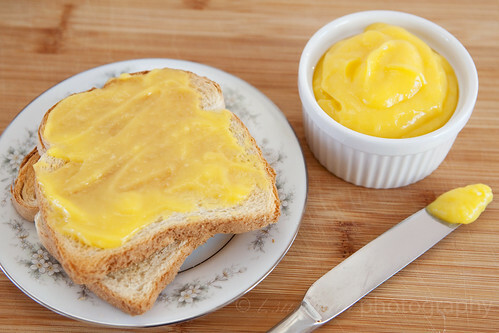 I make lemon curd all of the time and have never thought of making pineapple curd. And I love pineapple! I just discovered your blog from the link on Baking Bites. It’s really beautiful! Yum! I had egg yolks left over from making Macarons and some pineapple juice hanging out in the freezer. The curd was great as is, but decided to use it as a base for a “Tiramisu” for Easter dinner. Just combined the curd with 8 oz. of Mascarpone and then folded in approx a cup of heavy cream whipped to firm peaks. Doused the ladyfingers in Lemoncello and topped with fresh strawberries and black berries. Will definitely be making this one again.